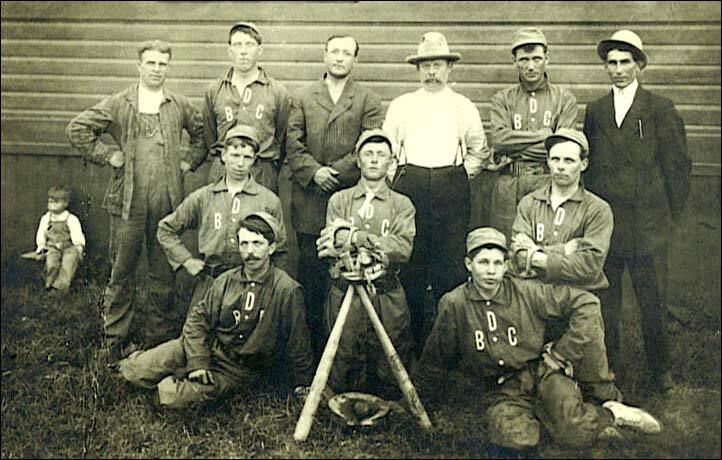 Back row - J. Cutler, Ed Smith, Fred Forster (Playing MGR), G. Long, B. Wakins, A. Charette. Middle row - C. Shack, M. Jewel, F. Zimmer. Front - Ernie Kemp, Bill Dayman. Missing - Wes Hogg, Frank Kaluzik, Charlie Weber. The youngster at the back left is Bryan Forster, the 3-year-old son of Fred Forster. Bryan was the team's batboy 1916-1922 and a player from 1923 to 1927 before a sparkling career in Saskatchewan and later British Columbia. He was inducted into the Saskatchewan Baseball Hall of Fame in 2012.